Hi kids! Here are some projects for you to try out. Use your imagination and have fun! Write to me and tell me how your Make-It project turned out! Print out the pages and pick one picture. 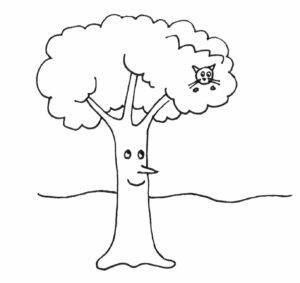 Color the picture; write or draw more pages if you want! Find different shapes of leaves outside on trees, bushes, and plants and inside too if you have any houseplants. What shapes did you find? Heart shapes, pointed ovals, leaves made of many leaflets? Very gently pick off a leaf from a plant or use dry leaves you find on the ground. Make a collection of 3-5 different leaf shapes. Put your leaves under a piece of paper. 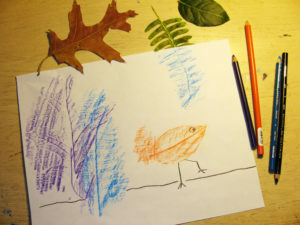 Use a crayon or colored pencil and color over the place where the leaf is under the paper. Look what happens! You can see the shape of the leaf and some of the details. Draw more on your rubbings paper to add details. Add eyes, legs, and arms to leaf shapes to make a character. What is happening in your picture? Tell the story! 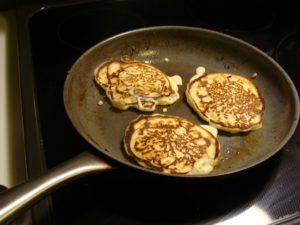 Cook up these pancakes for breakfast, lunch, or dinner! Be creative with your flavors and toppings to make your own Pancake Creation! Color (draw your own characters if you want), then cut on the dotted lines. 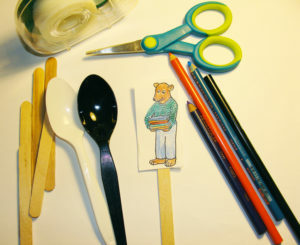 Tape a plastic spoon, popsicle stick, or unsharpened pencil to the back of each character. Now you can use the stick puppets to tell your own story! 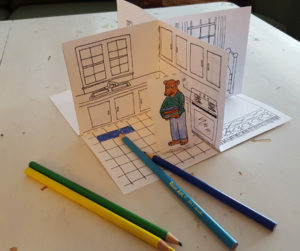 Make the Bear Family’s house and characters from “At Home with Books.” Print out these pages, color, cut, and fold into a table-top 3-D playhouse! It’s a little tricky to put together, so work together with a grown-up and follow the directions that are on the printed pages. In the end it should look like this picture. Find many more activities for Kids on the Parents page!